I have never been a big fan of tonkatsu (Japanese deep-fried pork cutlet). Before I discovered Tonkichi Tonkatsu Seafood, my impression of tonkatsu was just glorified meat served in Japanese style and hence a high price tag. And so imagine my delight one day when the better half brought me to Tonkichi Tonkatsu Seafood at World Trade Centre. The ambiance of the restaurant is nothing much to shout about (though it has been a long time since I last see a Hong Kong restaurant with this many private rooms and cubicles), the food itself was stellar. The deep fried pork was juicy on the inside, crispy on the outside, and you get to experiment with three different kind of sauces. 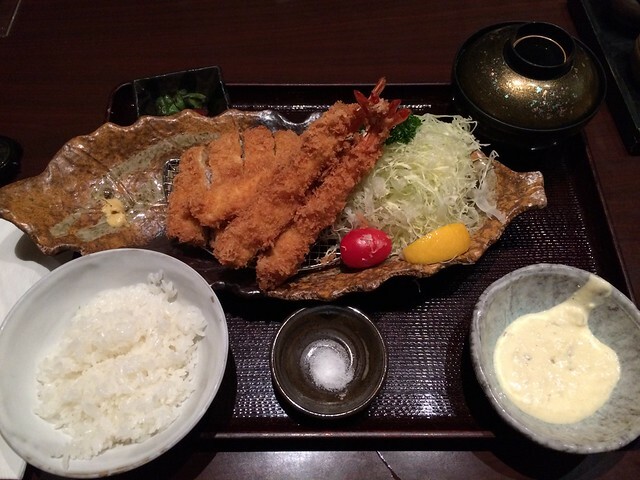 The jumbo-sized prawns were a favorite as well, I order them everytime I visited Tonkichi Tonkatsu Seafood.